What did my husband’s Scottish ancestors have to do with protecting the expensive clothing, shoes, and powdered wigs of the wealthy? So what is a chairbearer, or a chairmaster? They were archaic occupations from the 17th and 18th centuries, when the streets of Edinburgh were narrow, crowded with horse-drawn carriages, and filthy with mud, muck, and dust. The wealthy of that time, wearing delicate silk shoes, expensive tailored clothes, and elaborate wigs, would ruin their finery if they walked in the streets. The traffic congestion in tight alleyways often meant inconvenient delays when traveling by carriage, and some streets were too narrow to fit horse-drawn vehicles. 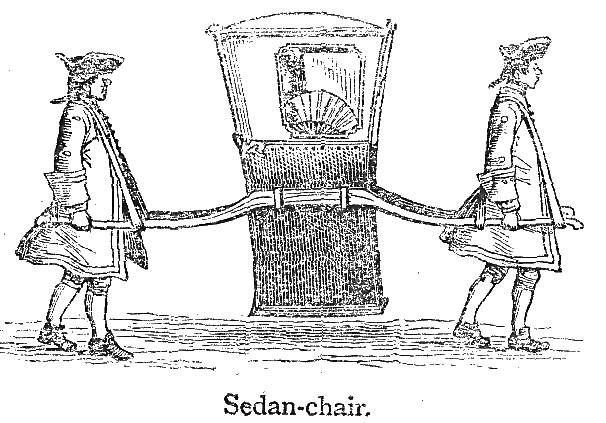 So a new conveyance became popular – the sedan chair. They were essentially a single chair enclosed in a box, suspended by two sturdy poles, which were held by two men: one in front, and one in the back. These men were called chairbearers. The man that owned the chair (or a fleet of chairs) or was the more senior chairbearer was called the chairmaster. The bearers wore something of a uniform, usually a long blue coat, black knee breeches with white stockings, and a large cocked hat. Sedan chairs were small enough that they could be carried along the sidewalk, avoiding traffic snarls in the street. As the chairbearers hurried along, they would call out “by your leave, sir!” to warn pedestrians to get out of their way. Sedans could be brought right to the door of a destination, or even be brought inside buildings, and they protected their passengers from inclement weather as well as dirty streets. In 1768, the fare for a trip within the city of Edinburgh was 2.5 pence, cheaper than a horse-drawn cab. Chair bearers had to be strong, healthy and agile to perform their back-breaking work at a steady, fast pace in all weather and with passengers of all sizes. It was said that many were sturdy Highland Scots. Was Andrew Yule’s family from the Highlands? Who knows – more research to be done.